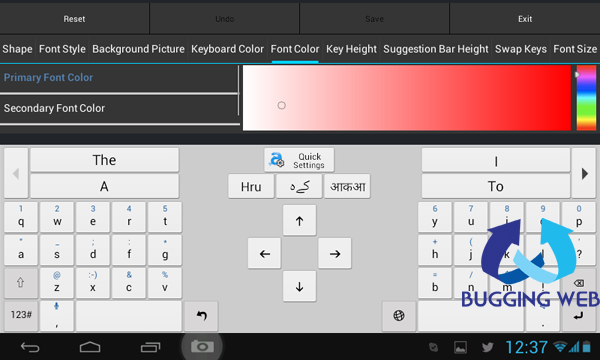 Adaptxt Keyboard App for Android with better features. Mostly when you buy a smart phone or a tablet it comes with bundled applications and software by default which keeps your Android device running. Am sure many times you want to customize factory default apps according to your choice. There are a lot of applications available in Google Play store, but today I will be sharing a detailed view on Adaptxt Keyboard app. Adaptxt is a part of KeyPoint Technologies, and with its expertise in User Interface technology and text input solutions it has partnered with major OEMs (Original equipment manufacturer) as their clients. With its popularity in Android platform Adaptxt is developing itself to predict and add gestures when you type. How is Adaptxt providing better User Experience? Smart Dictionary: Adaptxt supports 35+ specialized dictionaries which includes areas of Legal, Business, Medical, Sports, Finance and Technology. With the help of this it can provide your interest centric words when you type a finance or a medical term. Adaptive Vocabulary: Many time you use common words to express yourself, at that time Adaptxt understands it and saves most frequently used words. Whenever you start typing it suggests those words for prompt use. Supports 90+ languages: Adaptxt has a huge target audience. With the support in more than 90 languages, it is used across the world. Another better feature is that it responds in the same language in which the message has arrived. Error Correction: This is done in smart way, whenever you add an incorrect word it automatically swaps the word with the correct one. Added SMS abbreviations: Updated with abbreviations list like lol, rofl, gr8 etc. Users addicted to SMSs and applications like WhatsApp, WeChat and Hike can use saved abbreviations for fast replies on the messages. Customized Keyboard setting: With this option you can change the shape and color of the keyboard buttons in the way you want to use. You can even add any personalized custom picture on the keyboard and use it but this option is available only for the paid version of the Adaptxt. Apart from that you can even split the keyboard as per your need for better typing performance. Backup your dictionary: Once you are used to the Adaptxt keyboard app and you have added many frequently used common words then you can take a backup of those words added on your current device. You can even take a backup and restore it on another new device, by doing so you do not need to add the words again in the newly configured device. Add Social Accounts: You can add social networking accounts on the app for better management of this application. With the use of Adaptxt app on the social networking sites it will adapt the words more faster and give better user experience. You can download the Adaptxt application for your Android Smartphone and tablets from Google Play. « Share Instagram Images on your Site with Web Embed.